Customizable Backlit Logo gives your system a truly unique look with your own LED backlit logo design. 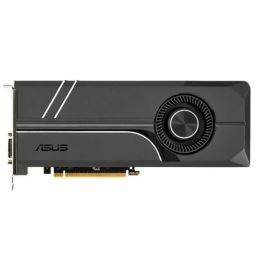 ASUS Turbo GeForce® GTX 1080 comes equipped with a dual ball-bearing fan for a 4X longer card lifespan and exclusive Auto-Extreme Technology with Super Alloy Power II components for superior stability. Customizable backlit logo enables a system personalization and VR-friendly HDMI ports let gamers easily enjoy immersive virtual reality experiences. ASUS Turbo GeForce® GTX 1080 also has GPU Tweak II with XSplit Gamecaster that provides intuitive performance tweaking and instant gameplay streaming. Without the problem of oil drying common in sleeve-bearing fans, the dual-ball bearing fan on ASUS Turbo GeForce® GTX 1080 lasts 4X longer. With reduced friction, it also runs smoother, further improving card lifespan and cooling efficiency. ASUS Turbo GeForce® GTX 1080 graphics cards have two HDMI ports for connecting a VR device and display at the same time, so you can enjoy immersive virtual reality experiences anytime without having to swap cables. ASUS Turbo GeForce® GTX 1080 comes with an LED backlit ASUS logo that you can swap with your own custom design for a truly unique look. Adjust clock speeds, voltages and fan speeds to tune your graphics card(s) exactly how you want to. Select between GPU Tweak’s Standard or Advanced modes depending on y..